Vancouver must have some strange noir envy. There was no renowned crime writer of the time to immortalize it as a location as San Francisco had in Dashiell Hammett. And there was no film industry in the country to envision noir stories set in Vancouver as San Francisco had in The Maltese Falcon (1941) or The Lady from Shanghai (1947). How else do we explain this fascination with making Vancouver a noir setting after the fact as in Jonathon Young and Kevin Kerr’s Tear the Curtain! 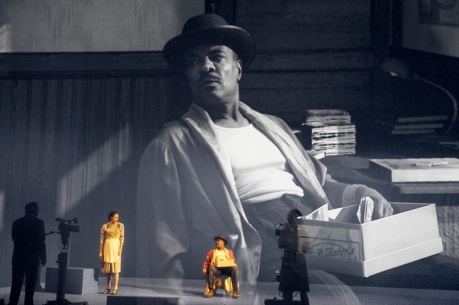 seen here in 2012 or in Stan Douglas and Chris Haddock’s Helen Lawrence now playing at Canadian Stage? Where Tear the Curtain! at least used its faux-noir set-up to pose the question of whether film or theatre was the superior genre, Helen Lawrence simply tells a noiresque tale simultaneously mingling theatre and film without bringing up the question of genre. The show’s goal is seemingly to be both at once. In reality, it winds up succeeding as neither. The action takes place on a blue-screen enclosed stage. Live actors are filmed in black and white by video cameras while Stan Douglas’s digital designs fill in the scenery. The two are mixed and projected onto a scrim covering the entire stage opening. Douglas has lighting designer Robert Sondergaard shine a yellow light on the actors so that we see them through the scrim. The reason for doing this is obvious but also points out the central flaw in the entire enterprise. Without the yellow light allowing us to peer through the black and white film on the scrim we would not know that the “movie” was being created live behind the screen. We would thus have gone to the theatre to see a play and wound up seeing a movie. Seeing what the live actors are doing and how they are being filmed is interesting, but the more one looks at that the less one looks at the big screen. Ultimately, viewing the live actors through the scrim is distracting. It’s like having to watch a “Making Of” documentary picture-in-picture while trying to watch the movie itself. All this technical ingenuity might be exciting if the story told were at least interesting, but it is not. Chris Haddock may be known for writing television scripts but storytelling techniques are certainly deficient on stage. Haddock tells his story in such a roundabout way that it’s almost halfway through the show’s 90-minute running time before we know which of the many plots he sets in motion is the most important. If Helen Lawrence were a real film noir playing on television, an ordinary person would have switched it off after a half hour. The main plot, in fact, is very simple. Helen Lawrence (Lisa Ryder) and her lover Percy Walker (Nicholas Lea) murdered Helen’s wealthy husband, but Percy left Helen to take the rap. She pled insanity and did time in a mental hospital. Now she has traced Percy north to Vancouver and wants revenge. Percy is now running a bookmaking operation out of the old Vancouver Hotel. It is 1948 and the hotel is reserved for returning servicemen, but Helen so charms the hotel manager Harry Mitchell (Hrothgar Mathews) that he lets her stay there while setting his eager jill-of-all-trades Jo (Haley McGee) to learn all she can about the mysterious guest. Haddock’s task is to prevent Helen, who is staying in an all-male hotel, and Percy, working in the same hotel, from meeting until the very end. To do this he basically pads out the story with three secondary plots that have little or nothing to do with the main plot. All have something to do with the once-infamous Hogan’s Alley, a den of vice in ‘40s Vancouver. The most substantial of these subplots involves the corrupt Police Chief James Muldoon (Ryan Hollyman), who in order to be re-elected wants to be seen to clean up Hogan’s Alley, even though he receives regular kickbacks from its businesses. The last major business to clear out belongs to Buddy Black (Allan Louis) whose speakeasy he wants Buddy to transfer to his brother Henry (Sterling Jarvis) to make it look as if Buddy has left the area. Meanwhile, prostitute Rose George (Emily Piggford), has a fling with Muldoon’s equally corrupt Sergeant Leonard Perkins (Greg Ellwand) and manages to steal his officer’s badge. She, nevertheless, thinks that the right man in the person of a French-Canadian may have come along. At the same time, down-on-his-luck ex-serviceman Edward Banks (Adam Kenneth Wilson) keeps begging for money from the other characters, not knowing that his German wife Eva (Ava Markus) needs money for an abortion and has sought the cash from Mary Jackson (Crystal Balint), the woman Buddy is living with. All these might be interesting if the show had been set up as a portrait of postwar Vancouver society, but it hasn’t. It’s been set up as a film noir but the several subplots keep us wondering what connection, if any, they have to the main plot since none of them move it forward. Helen Lawrence as a story is unsatisfying not just because it lacks any of the tension or suspense one associates with its chosen genre, but also because Haddock simply casts out the subplots when they have served his purpose of delaying the ending. One subplot ends with an accidental killing and Haddock simply does not provide the conclusions of the other two. All this being said, the cast does a terrific job of acting and, as it happens, filming the show. Given the nature of Douglas’s concept the actors have to be judged on how they act for the camera since they do not act directly for the audience. The best performances for the camera come from Balint, Jarvis and Louis, who are the most adept at conveying emotion carried through in film. Close behind them are Markus, McGee and Piggford, with McGee at least given the chance to enliven the show with comedy. As the title figure, Ryder too often seems to be striking a pose rather than playing a real person, let alone one who had been interned in a mental institution. One could say that the show was a triumph of style over substance. Indeed, scenery designer Kevin McAllister and costume designer Nancy Bryant have the 1940s look down perfectly. As film, however, four mobile video cameras and two stationary ones, can’t substitute for the myriad of angles and cuts that film allows. The resulting attempt at a ’40s film noir looks more like filmed live television in the 1950s than an actual film. The repeated use of reverse angle shots for conversations is pedestrian, views of body mics over actors’ ears looks cheesy and actors’ heads casting shadows on speaking actors’ faces is simply inept. While it is good to experiment with the integration of film in theatre, Helen Lawrence is an example where the show succeeds neither as film nor as theatre. The show I’ve seen that most successfully integrated the two media is still La Belle et la bête (2011) by Michel Lemieux and Victor Pilon. If the idea of using film is to help in rapidly changing scenes, the solution for that was discovered more than 400 years ago. Elizabethan playwrights played on empty stages since they trusted their words and the audience’s imagination to set the scene. The creators of Helen Lawrence seem to trust neither. Photos: Lisa Ryder and Hrothgar Mathews; Crystal Balint and Allan Louis. ©2014 David Cooper.